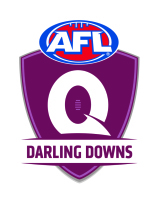 08/02/2018 Do you want to dine with the Brisbane Lions? 06/09/2017 Kinderkick coming to a Kindergarten near you! 31/08/2017 Marj Shaw Medal, who are the favourites? 31/08/2017 Who are your clubs, Heather Green Medal favourites? 30/08/2017 Who are your clubs, Holman Medal favourites? 21/08/2017 Junior Girls RAMP, get involved! 01/09/2016 AFL memorabilia auction items – bid now!! 07/07/2016 Darling Downs products in the big time. 28/06/2016 Darling Downs junior results for round 10. 15/07/2015 Darling Downs kids take to the Gabba. 18/05/2015 Senior representative footy is back! 08/05/2015 Tigers look to take down the High Flying Bombers. 17/04/2015 Open Invitation for Under 14 and 16's Representative Squads. 17/04/2015 Tigers and Swans do battle in the ASN round 2 challenge. 13/04/2015 Three DD Women's players play in All Star Clash. 10/04/2015 Roo's look to bounce back against the Marching Saints. 07/04/2015 Allied Pickfords Cup Round 1 Wrap Up. 26/03/2015 Lockyer Valley Auskick Gala Day. 21/10/2014 Road to 2015: Are you ready to take the next step? 11/09/2014 Can Highfields roar against the Bombers? 09/09/2014 Who will the Holman Medal go to this season? 29/08/2014 Swans ready to repeat round 18 feats, but can they? 14/08/2014 Can the Swans ground the high flying Bombers? 18/07/2014 Mission Impossible for Navy Roo's? 09/07/2014 Allied Pickford's Cup: Five to four? Reddies, Cougars, Roos, Bombers or Hawks? 04/07/2014 Who is the regions top ranked female footballers? 04/07/2014 Is the 2014 Holman race already over? 25/06/2014 Blackchrome Cup: Third times a charm for Reddies? 16/04/2014 Division 2: Father and Son Rule? 26/03/2014 AFL and Sudanese: A perfect match? 06/03/2014 TIPPING IS BACK! And it is FREE to join. 08/02/2014 Did you play in 2013? Re-Register now for 2014 season! 09/12/2013 Are You A Fan? 09/10/2013 School Holiday Super Party a Hit! 02/08/2013 Perfect Season or Fairy-tale? 12/03/2013 DO YOU THINK YOU'RE THE TOP TIPSTER? 06/09/2012 Footy Colours Day - This Friday! 05/09/2012 Can Bombers Reach Maximum Altitude? 05/09/2012 Will history repeat itself? 03/09/2012 Can the Swannies take all three? 29/08/2012 Who can fly higher, Souths or Dalby? 29/08/2012 Who has the loudest Roar? 23/08/2012 Can The Cougars Stop Tom Matthews? 21/08/2012 Want To Play Footy Against Daisy & Goodesy? 15/08/2012 Who's Flag Will Rise First? 03/08/2012 Can the Demons Double-up? 01/08/2012 Who wants to play finals? 24/07/2012 Roos Vs Tigers Preview Round 16. 11/07/2012 Will Bombers have their Wings Clipped? 20/06/2012 Do you want to be a Sunfire Superstar? 19/06/2012 Who will get hung out to dry? 29/05/2012 Redbacks: More venom required! 03/05/2012 Are you the NAB AFL Auskicker of the year? 17/03/2012 Get even more local footy news! 24/02/2012 Footy is back this weekend! - FOR REAL! 26/10/2011 International Rules Series almost underway! 06/07/2011 2011 SUPER CAMP - judged the best yet! 07/04/2011 Girls just want to Play Footy! 27/01/2011 Crows and Souths raise money for flood appeal. 12/10/2010 Purchase your AFLDD GF DVD NOW!! 30/08/2010 Who will face the Tigers? 27/07/2010 Its On, Its Big - Book Now! 02/07/2010 School Holiday Clinic - Still places available BOOK IN NOW! 16/06/2010 School Holiday Clinic - Register Now! 31/08/2009 Crows Soar to First Ever Premiership! !